What I miss most about living in Japan is hanami, a tradition which celebrates the cherry blossoms. Depending on the particular year, people enjoy it from the end of March until mid-April. 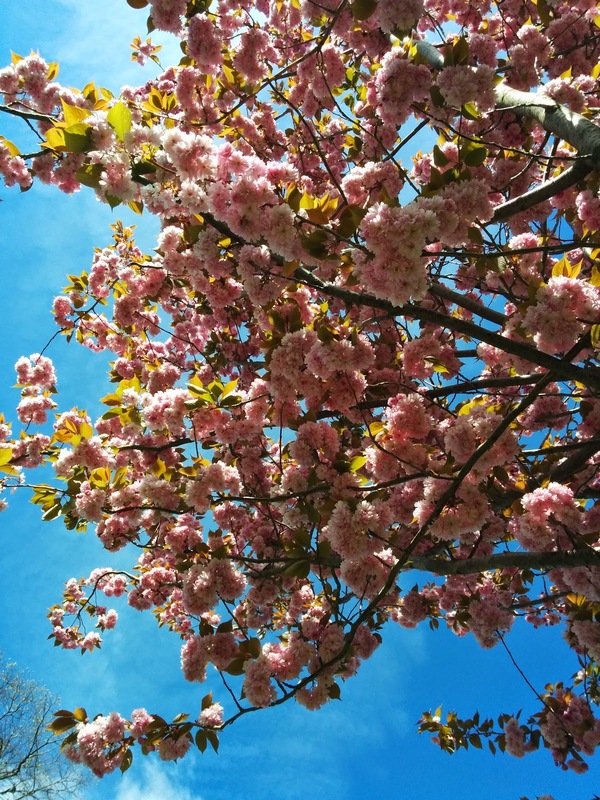 The hanami period is usually still chilly but you can feel the first warm sunbeams on your skin. When you want to enjoy cherry blossom in the open air, you pack a little picnic with a bottle or two of beer, your camera, a plastic mat and go to a park. An occasion such as hanami, parks are usually overcrowded, so you walk in circles for a while to find a free spot to sit. Once you have unpacked and settled, you can start enjoying the cherry blossoms. I can hardly find words to convey the beauty of it! 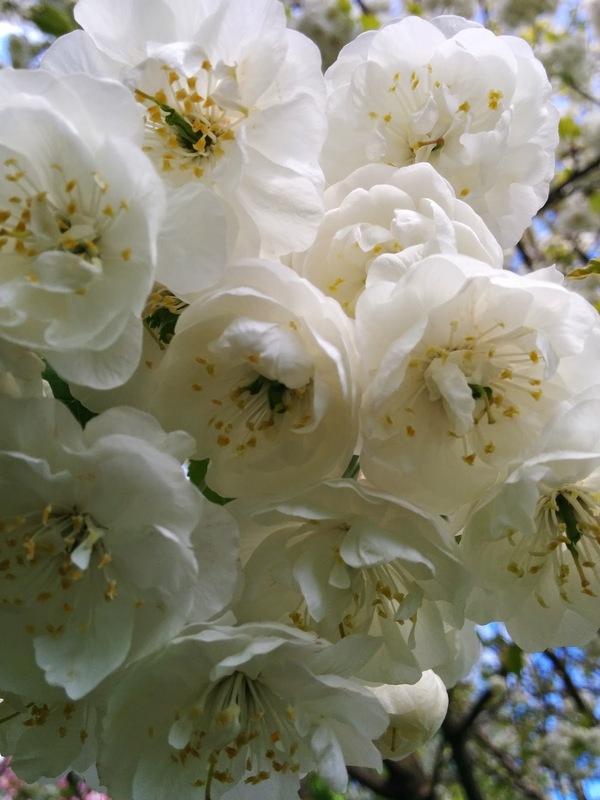 White and pink cherry blossom petals float in the air resembling snowflakes. They land on the ground, on your mat, on your hair but they don’t melt. You carefully inhale the fragile perfume of cherry blossom, spread your body across the mat and close your eyes in absolute happiness. The park in front of my building grows a lot of cherry and plum trees. I may have found this place intuitively to be able to enjoy my own little hanami in Dublin. Last week, all the cherry flowers were in perfect full bloom: that’s when I decided to take pictures of my latest creation, long-sleeve ruched dress from the February Burda Style issue. When I first posted preview pictures from this issue on my Instagram, many people commented on this particular pattern, saying that it was “my type of dress”, and maybe they were right. What I admire most about this dress is the raglan sleeves and fitted silhouette. To make it stand out, I decided to use some plain dark jersey and, without thinking much, I started working on it. For Burda patterns, I am a 36 size in the bodice and a 38-40 for the bottom. Since the fabric I used for the dress stretches a lot, I cut my pattern in a size 38 without any seam allowances and it fitted me right. I also lengthened the sleeves by 6 cm and when I cycle, or when I am cold, I pull them out to cover the palms of my hands. I know that it’s a very teenagery thing to do, but I like it! After I finished taking pictures, I spread my coat on the grass under the tree and laid down, admiring the tiny cherry flowers. Here, I was in another country, where unlike in Japan, the park was absolutely empty, but I was overwhelmed by the feeling of happiness. You're right, it is both practical and elegant. I do wish to visit Japan during hanami at some point in my life! You look lovely in this dress. It's a great fit. Looks like you have the park all to yourself too. Lovely dress and beautiful blossoms. I loved your description of Hanami! Such a good narrative post, so good that its like I was in one of those parks watching the cherry blossoms float in the air. Not to mention that I'm addicted to cherries. About your dress now, it looks very flattering on you and you're right it looks comfy and elegant too, it's one of those dresses that you can wear it at work and then at a night out. this dress looks perfect on you! I totally agree with aida on the day to night - with minimal styling you can take this from the office to a night out with your girlfriends no problem. Love those cherry blossoms ! This looks great on you! Maybe because I've seen you in less form fitting shapes mostly (or maybe I'm remembering wrong) . But you look stunning in this dress! The dress looks fantastic on you - and you have the figure to carry it off! The cherry blossoms look so beautiful, I can see why just being surrounded by them made you happy. Aesthetics as a source of basic happiness is wildly underated here in Canada. I will share these pix with my DH who emigrated at 12. I'm looking forward to visting Ireland with him some day. I hope your wish comes true! YES! Although the park is huge, there are very few people there. Thank you, Sasha! I like 'the-office-to-a-night-out' garments! Thanks, thanks! I think I should wear more fitted clothes, although I feel more comfortable in shapeless garments. . . Decisions, decisions. Everyday aesthetics is underrated in most countries, not only in Canada. When I lived in Japan, I was so blown away by the appreciate people give to little things like flowers, drops of water, spider nets, clouds. I also feel like I became more sensitive to the world around me, undertones. Let me know when you come to visit Ireland :) I would be happy to show you around! Your version is great, I think I might try and make one for myself, too. I'm not too happy with clothes clinging too tight but maybe if I refrain from eating too much (belly sticking out...) and choose thicker jersey it won't be a problem. What a beautiful post! This really is the best time of the year- all the trees on my block are in bloom and it's hard not to smile when you feel the warm sun on your face! But I can only imagine how beautiful it must be in Japan! The dress looks so lovely on you and I'm glad that you're experiencing some lovely spring, even though you're half a world away from your old home! This is such a happy post! 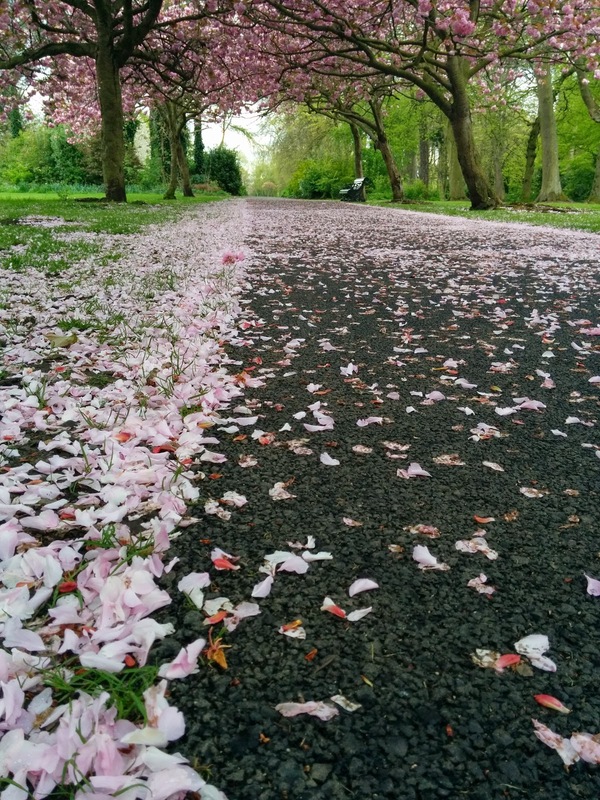 I'm so glad you managed to find some cherry blossoms in Dublin - I've been really missing them here (although I did get hit on the head by a magnolia so maybe that counts?). The dress is fantastic - sort of like a plum blossom dress! I think I need to copy you with this dress because it looks perfect for my trip to Europe! Hurray for Burda magazine patterns!